When Big City Moms decides they’re going to do something, they always do it right. So last week, when hundreds of new and expecting moms poured into the San Francisco edition of The Biggest Baby Shower Ever, it was no surprise that it was a smashing success. 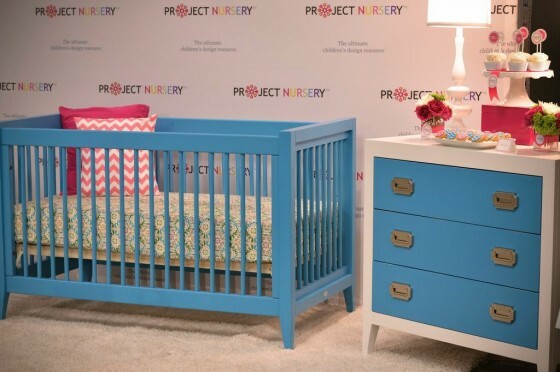 Project Nursery created a nursery that was bold, bright and blue. Thanks to the help of some wonderful partners, we loved the overall look and hope you do, too! A big thank you goes to Newport Cottages for their gorgeous Devon Collection crib and changer in that spectacular Bahama Blue color. This collection can be found exclusively at Sprout San Francisco. Sprout specializes in organic, natural products, like the elegant, white glider on display, which is made with 100% certified organic materials. The gorgeous mod-patterned crib sheet provided by Oliver B was on display and was a big hit. Oliver B generously sent one lucky shower attendee home with a bedding set! We also had Natalie Gordon, the founder of the universal registry site Babylist, on hand to help expecting parents with all of their registry needs. Of course, it wouldn’t be a baby shower without some sweets! We adore the talented work of Sweet Lauren Cakes who created our lovely cake pops. We also need to thank Edible Details for the beautiful, perfectly colored pink and blue fondants. All the fun of the night was photographed by Melissa Sanchez of SavvyInSanFrancisco. Thank you for capturing the details and all of the smiles throughout the event. In fact, it was such a great night, we are sure everyone left their hearts in San Francisco! What made you decide on a pink-white-and-blue color scheme for this event? I think it’s because these are classic/traditional baby nursery colors. And they brought a modern twist to it. Hi Andrea, It’s actually a great question! We wanted to do something brighter this time around since we are seeing a lot of nursery furniture that pops with color. We absolutely fell in love with the Bahama Blue color from Newport Cottages and paired with our signature PN hot pink we thought it was bold and beautiful but still appropriate for the nursery. What colors would you like to see next?